Ed Sheeran, Sam Smith and Dua Lipa helped the British record industry earn £408m overseas last year, the highest figure on record. 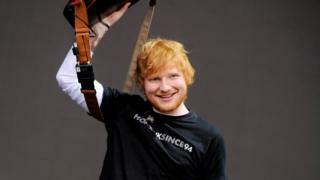 Export revenues from recorded music grew by 12% compared with 2016, fuelled by "phenomenal global demand" for Ed Sheeran's Divide, said the BPI. The record sold 6.1 million copies last year, beating releases by Drake, Kendrick Lamar and Taylor Swift. But the BPI warned a "bad Brexit deal" could harm British music's profits. "With Brexit approaching, music can help to showcase what is exciting about the UK as we forge new trading relationships," said chief executive Geoff Taylor. "But only if our government supports us by ensuring a strong Brexit deal that enables artists to tour freely, robustly protects music rights, and prevents physical music products being impeded in transit." The BPI said the value of British music exports - sales of CDs, vinyl, streaming and downloads of singles and albums - has brought in more than £5bn since it started tracking revenues in 2000. Europe is currently the record industry's biggest overseas market, generating £165m in revenues last year. It is closely followed by the US, which accounts for 35% of the UK's music earnings - but the industry is also seeing rapid growth in new markets including China, India and Brazil. In total, UK artists accounted for one in every eight albums consumed globally in 2017, the BPI said, with British artists creating four of the year's top 10 best-sellers. Once overseas payments were taken into account, the industry contributed £200m to the UK economy last year. According to UK Music, the industry's total export revenues are roughly £2.5bn, with live music, publishing and royalties also contributing to the coffers.